People will spend countless time and money in order to heal the body and mind. Through massages, facials, and chiropractors, we all just love to feel happy, healthy and aligned. Well, your favorite furry friends can now experience this same kind of rejuvenating relief from aches and pains through acupuncture for dogs. For those of you who’ve never been exposed to acupuncture, it’s a 3,000-year-old Traditional Chinese Medicine healing technique used to promote natural self-healing by stimulating different anatomical parts of the body. These sites are known as acupuncture points or acupoints. The process of stimulating these sites may, at first glance, seem painful to some, but don’t be alarmed, many people experience very little pain apart from a pinprick during the process. The benefits of acupuncture are more than enough to keep you going back for more. The most common method of acupuncture treatment is the insertion of fine, sterile needles into the skin at the site of an acupoint. While the idea of inserting needles into the skin to increase well-being may seem crazy to some, the positive effects are undeniable. Veterinarian and Dog Acupuncture specialist Dr. Rachel Barrack had the same initial reaction to the treatment. “I can understand being skeptical of acupuncture initially, even I was before I fully understood how it works and saw firsthand the incredible benefits of this practice. Although relatively new in the Western world, acupuncture has been the mainstay of Chinese medicine for thousands of years”. Traditional Chinese Medicine is based on an ancient philosophy that the universe and the body (yin and yang) need to be balanced in order for the body to be healthy. Energy, called “qi” flows through pathways in the body, and a blockage of “qi” can result in pain, loss of function or illness. Acupuncture therapy is the process of releasing this blocked “qi” to bring the body back to its natural, healthy state. Hundreds of modern studies have shown that acupuncture can successfully treat a wide variety of musculoskeletal problems in humans, including headaches, back pain and even infertility. Acupuncture is not only for those experiencing chronic health difficulties, but it can also be used for everyday issues, such as to improve sleep, digestive function and an overall sense of well-being. With the kind of amazing transformation that acupuncture can provide, wouldn’t you want every member of your family feeling this good? Now, acupuncture for dogs is growing in popularity, and it’s proving to provide an equal amount of symptom relief for our furry friends. If you’re worried that inserting needles into your dog’s skin could be dangerous, know that acupuncture therapy is one of the safest therapies available when administered by a veterinarian who has received post-doctoral education, and negative side effects are very rare . In Dr. Barracks experience, “The needles are so tiny that they cause minimal discomfort to your pet and have the potential to be life-changing. Many animals find the process so relaxing they fall asleep during treatment”. No two acupuncturists are the same, and in order for the process to be safe and effective, it’s important that you find a reputable practitioner. The repercussions of having a non-professional acupuncturist could be life altering for your pet (and not in a good way). In order to become an acupuncture therapist, the practitioner must first be a licensed veterinarian and must undergo extensive additional training in muscle physiology, anatomy, and acupuncture techniques. You’ll want to hire someone with the highest credentials, as opposed to someone who took one class on dog acupuncture. Many acupuncturists will work out of a veterinarian clinic, but there are some that will make house calls if your pet has difficulty moving. If you’re looking for a dog acupuncturist, a good place to start your search is to ask your local vet clinic to see if any service is offered there. Veterinary acupuncturists can specialize in certain species, with equine and canine being the most common, so be sure to find a vet that is experienced in working with your pet. Before acupuncture is performed, the veterinarian should conduct a physical and acupuncture examination on your pet. This is for safety, and to ensure that the dog is a good candidate for acupuncture. If a practitioner does not conduct this exam, that could be a red flag of inexperience, and you might want to consider switching acupuncturists. The main disadvantage of acupuncture is the owner’s expectation of its use. 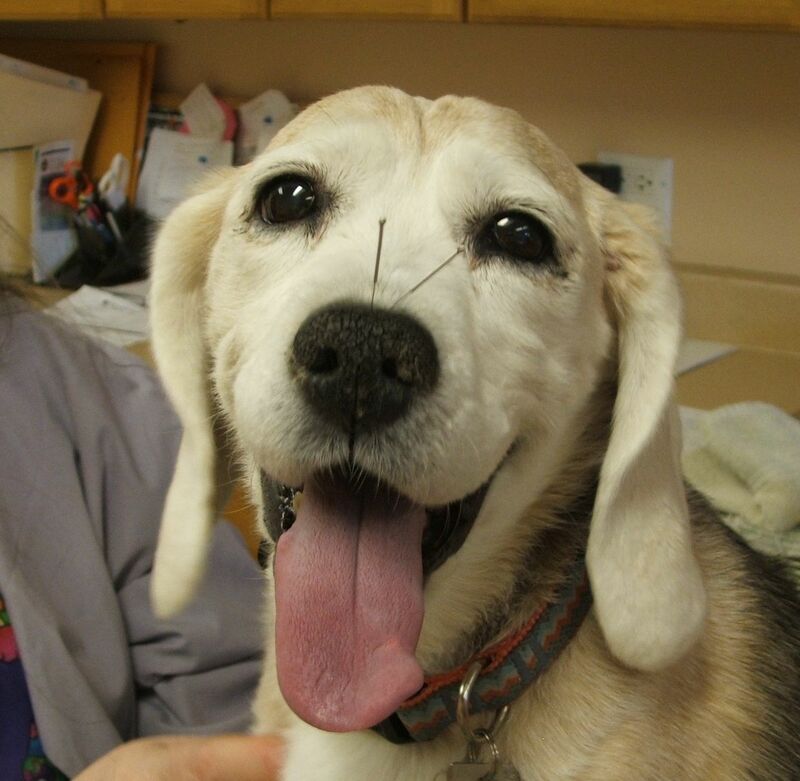 Acupuncture will not miraculously cure your pet after one session. Think of acupuncture as less of a magic pill, and more like a chiropractic appointment, where follow-up sessions are needed in order to achieve and maintain the desired result. Another possible disadvantage is the chance that your dog will overuse an injured limb because the pain will be relieved from the acupuncture. This could lead to further injury. That being said, the disadvantages are very rare in comparison to the advantages, and the positive feelings that acupuncture can provide for your dog will greatly increase his quality of life overall. Old age does not need to be a negative experience for your dog. Canine acupuncture can help to alleviate your dog’s pain and increase his quality of life, which will help to put a big smile on your face. You can help your dog to feel like a puppy again (without the chewing and potty training issues that goes along with puppyhood!). Would you try out this new treatment with your pet?